Tuesday 19th September, Upper Hutt Cossie Club, 7pm. Community representative and Staff representative votes need to be in tomorrow! These can be delivered to the association, emailed through to agm@wmkindergartens.org.nz or handed in at the AGM on Tuesday. Kua whea Ngā Māra Tamariki o He Whānau Manaaki o Tararua i te hīkoi mo te wiki o te reo Māori? Ngā mihi mahana kia koutou i tēnei wiki Mauriora, Pūkana! We had an awesome response to our press release regarding the detrimental wait times for learning support. Click on the link to see each article. Feel free to spread awareness by sharing these stories on your Facebook page! Version 2.93 of Infocare is being installed for all Infocare users this week. This new version contains important updates to comply with new Ministry of Education ELI requirements. It is a new ELI requirement that children cannot be enrolled unless they have been allocated an NSN. With Version 2.93, when you are creating sign in sheets, you will be notified of any children who have not had an NSN allocated. These children will not be included in the Sign-In Sheet. You will need to assign an NSN for these children on the "Child Selection" screen, and then add these children to the sign in sheets once the NSN has been allocated. The Notice Board displays children without NSN's two weeks before they are due to start. If the child’s official identification documentation is unavailable, you can request to have an unverified NSN assigned by contacting the Ministry of Education on 0800 ECE ECE (0800 323 323). This will enable you to search and assign the NSN to the child. You should seek to obtain the official identification documentation within two weeks of the enrolment and update the NSN to verify it. Please contact Tania Braybrook tania.braybrook@wmkindergartens if you require assistance with this matter. The following First Aid Refresher courses to be held in Term Break. These courses are for certificates that have expiry dates from 11 July 2017 until the end of January 2018. The 4th October course has been oversubscribed, therefore if anyone would like to change to another date, please contact either: Hannah.toomaga@wmkindergartens.org.nz or andrea.godfree@wmkindergartens.org.nz. Please also be advised that the course being held on the 3rd October is in Paraparaumu. If you have enrolled on this day and did not realise this, please let Hannah or Andrea know and we can change it. These are the last Refresher courses for 2017. The next Refresher Courses will be held at the end of Term 1 in the term break. Dates and venues to be confirmed. For any teachers that require a full comprehensive course or are unable to make a refresher course on the above dates, we are asking First Aid Specialists to provide us with a date to be held on a Saturday in Porirua. This will be a one-off course. Please contact either Hannah or Andrea for details. If you are a short term reliever for the Association, you are welcome to enrol in any of our first aid courses, however there will be a cost associated with this. We have a matter of days to go before the election of a Government that will determine the future health (or otherwise) of early childhood education – the wellbeing of hundreds of thousands of babies and young children, and the quality of support for parents, whānau, and for teachers and staff that work in early childhood education. A Whānau Newsletter is going out to families today. A copy of the Election Kit is attached again for your reference. Encourage parents and whānau to vote early – ensure your own family and extended family members vote. Mandy is driving several of her young cousins to the early polling booth: you could consider doing the same! Every little bit counts – you individually can make a difference. It is imperative that people get out and vote – not just because it will determine the next Government, but because participation in the democratic process the fundamental principle of democracy – non-participation weakens the system. In the Commission’s view, maintaining a healthy democracy should be regarded as a matter of strategic national interest. A healthy democracy is in everyone’s interest. It is a quintessential public good. However, it is not something New Zealanders can afford to take for granted. The values and culture that underpin it need to be learned and nurtured. Turning the current trend around will not be easy. It certainly is not something the Commission can achieve alone. To read the Electoral Commission report on the 2014 General Election click here. 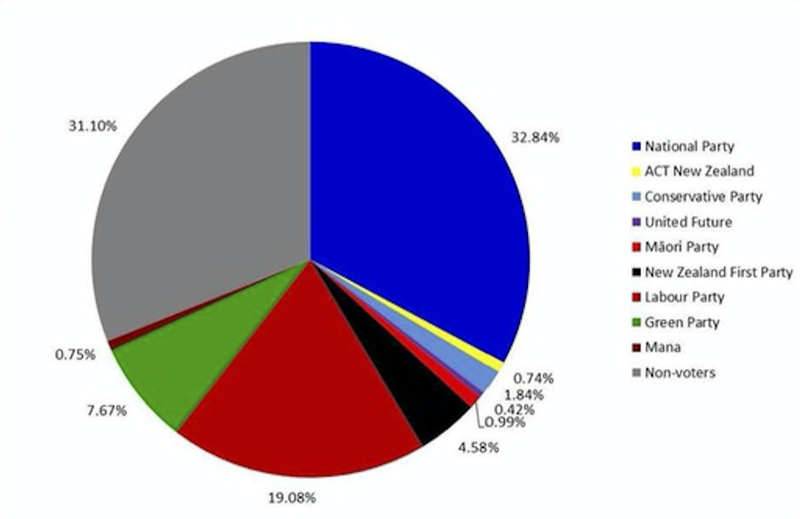 The graph below indicates the percentage vote for each political party in the 2014 General Election. It also shows the percentage of people enrolled to vote but who did not vote (in the grey). Let’s reduce that percentage significantly! Congratulations to the following on their recent appointment.